Is Your E-Cig Actually "Safe"? Electronic cigarettes (e-cigarettes) have seen a huge increase in popularity over recent years. There are reports indicating that the e-cigarette market in the UK during 2014 was worth over £250m and that there were well over 1 million e-cigarette users (who are sometimes referred to as “Vapers”) in the British Isles. With the rise in popularity of e-cigarettes, the number of reports of fires that are said to have been caused by one of them “exploding” or otherwise failing has also increased. E-cigarettes contain batteries, usually ones that recharge from a USB power supply, and it is sometimes suggested that the use of the wrong power supply, e.g. one for a mobile phone or a travel adapter, is the cause of an e-cigarette failure. Some reports have suggested that the wrong power supply had supplied too high a current to the e-cigarette. Is this the whole story or a misconception? Burgoynes have investigated several fires and incidents that have involved e-cigarettes and a review of those investigations was undertaken for this article. That review suggested that the use of the wrong charger was not the key factor in the e-cigarettes that had failed and caused fires. We have undertaken a series of tests designed to indicate the most significant reason or reasons for e-cigarette failures. The two most common designs of e-cigarettes on sale in the UK comprise those that are very similar in appearance to traditional tobacco cigarettes; and those that have a transparent, visible reservoir for the liquid. Although the two types look very different, both have the same basic components, in that each has a battery, a reservoir and an atomiser. The atomiser contains a heating coil that, when connected to a battery, heats to vaporise the liquid, which the user then inhales. The battery is the item of interest in this study. The only confirmed e-cigarette battery failures of which we are aware occurred while the battery was being charged. Both types of e-cigarettes are normally supplied with a screw-on adaptor that enables the battery to be charged. Once the reservoir and atomiser part of the e-cigarette are unscrewed from the battery, the adaptor is then screwed onto it. The adaptor usually has a USB-style plug, which can then be connected to any USB socket. There are two types of screw-on charging adaptor that are supplied with e-cigarettes and each type is shown in the above photograph. The first type of screw-on adaptor, (hereafter referred to as a ‘straight-through adaptor’, which is pictured below) is generally supplied with the e-cigarettes that look like traditional tobacco cigarettes, although they are also sometimes supplied with the visible-reservoir type of E-cigarette. This type of adaptor has no electronics to reduce the voltage from the USB socket to the battery (which is 5.1V (Volts) as standard), or to end the charge when the battery reaches a fully charged state, hence the term ‘straight-through’ adaptor. The second type of adaptor (pictured below) is normally supplied with e-cigarettes that have a transparent reservoir. They usually have electronics to ensure the battery is charged safely, i.e. to limit the voltage to 4.2V (Volts) and to switch off the charging current when the battery reaches its full capacity. This type of adaptor is hereafter referred to as a ‘4.2V adaptor’. It is noted that, although the two types of adaptor often look different (the latter type often having a short flexible lead), the screw connector used to connect the battery to both types is the same, which means the two types are seemingly interchangeable with one another. To demonstrate, the photographs show each type of adaptor with the wrong type of battery connected to each of them. The other end of the adaptor employs a USB plug, which has to be plugged into a USB socket in order to charge the battery. As may be appreciated, USB sockets are available on a variety of devices, which include laptops and, more recently, power supply units that are supplied with mobile telephones (including smart-phones) or tablet computers. Although a comprehensive review of the battery used inside e-cigarettes is beyond the scope this article, the battery used is normally a rechargeable lithium-ion cell. Such cells have a nominal output voltage of 3.7V (Volts), although they have differing energy storage capacities, expressed as mAh (milli-Ampere-hours). It is noted that the standard operating range of a standard lithium-ion cell is nominally between 3.0V and 4.2V, the lower value being the fully discharged state and the higher voltage indicating the fully charged state of the cell while it is on charge. Overcharging of a lithium ion battery (cell) can result in its failure and the failure can sometimes be violent in nature, that is to say the battery can effectively explode due to thermal runaway. There are two primary ways in which such a battery may be overcharged, either by an excessive charging voltage being applied (e.g. 5V instead of 4.2V) or by it continuing to be charged after it has reached a fully charged state (i.e. the charging current not being switched off). As noted above, the press often attribute incidents involving e-cigarettes to be the result of the wrong type of “mobile phone charger” having been used to charge the battery. We undertook tests using the correct type of screw on adaptor for the respective battery. The screw-on adaptors were in turn connected to USB power supply units that had rated output currents of 2A and 3.1A. Those tests did not result in any failures of e-Cigarette batteries. It is, however, noted that relatively few tests were done, hence the possibility that this configuration might lead to a failure cannot entirely be discounted. In comparison, a similar number of tests were conducted on batteries that were supplied with a 4.2V adaptor, but they were charged using a straight-through (USB voltage, 5.1V) adaptor instead. Two catastrophic battery failures occurred during the tests that were undertaken in this configuration, one of which occurred when a 1A rated power supply unit was being used1. It was also noted during the tests that the battery failure was random, in that one failed after two charges with a straight-through adaptor connected to a 2A power supply and the other failed after six charges with a straight through adaptor and 1A power supply. 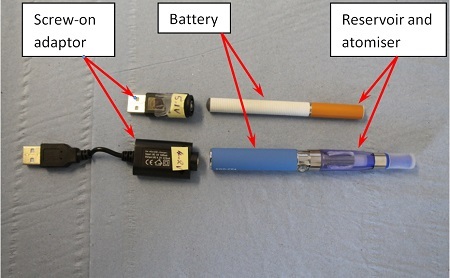 The results of the tests that have been undertaken to date, albeit on a limited number of samples, suggest that the use of the wrong type of screw-on adaptor, rather than the use of the wrong power supply unit (mobile phone charger), is likely to be the most significant factor in the catastrophic failure of e-cigarette batteries while they are being charged. As may be appreciated from the foregoing, the two types of screw-on adaptor can be readily interchanged with one another by a user. Some straight-through adaptors carry a warning symbol (pictured above) but others are un-marked. It is, however, unlikely to be apparent to the majority of the general public that this type of screw on adaptor should not be used with any battery that it readily fits, as the above-mentioned tests and incidents clearly show. Indeed, comments provided to one Burgoynes investigator by an insured after one recent incident was to the effect that “if the plug fits then it’s safe to use”. In these circumstances it is considered that further similar incidents are likely to occur. In addition, as e-cigarette batteries may well be left on charge overnight, the consequences of failures could be serious.